Isaac Brynjegard-Bialik: Nice Jewish Artist: Aseh l'cha rav,u'kneh l'cha chaver. In Pirkei Avot 1:6 we read, "Aseh l'cha rav, u'kneh l'cha chaver" -- "Find yourself a rabbi, and make yourself a friend." The folks who commissioned this piece are planning to give it as a gift to a rabbi friend of ours, and I'm very pleased. 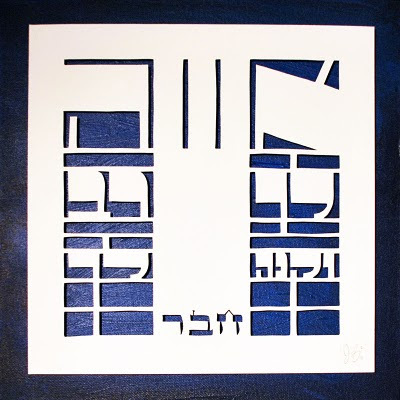 I structured the piece around the Hebrew verse, using the "shin" of "aseh" as my fulcrum, lengthened from top to bottom and creating an allusion to the form of a mezuzah. The final word of the verse is key -- "chaver/friend" -- and so it is treated differently, cut out in the lettering style of Jewish scribes. The piece is cut out of Arches watercolor cold press stock, mounted above a square canvas painted in glowing tones of blue; the interplay of white and blue / light and shadow really came out great.